The Thelen Tree Farm is located on the side of a mountain between 450 and 600 feet elevation in the town of Woodland, Washington USA. Our property is part of the old "Elephant Farm" which was 75 acres owned by an animal trainer and dealer named Morgan Berry. He had up to nine elephants and many other wild animals in barns and cages on this property. He passed away in June of 1979. Life magazine March 1980 has an article about this elephant farm. We purchased ten acres in 2001 and have been planting trees every year since. It is classified by Cowlitz county as Open Space Timber Land. Our primary crop is Douglas fir but we also have a few native Western Red Cedar, and some Alder and Maple trees. In 2001 we hired a forester to design a Timber Management Plan for us. Since then, we have been planting and maintaining our tree farm. Presently the largest Fir trees are about 12"-15" in diameter and our Timber Management Plan says that we should expect to start harvesting some of them in about 15-20 years. Clearing and Planting: Much of the timber is on the side hill and the 4x4 tractor with backhoe makes the clearing and brush removal easier prior to planting. We buy our Douglas fir seedlings from a local grower here in Woodland (Lewis River Nursery). We plant them by hand with a Tree Planting Shovel. After we plant the seedlings they need to be monitored for 5 - 7 years for competing vegetation (grass, shrubs, hardwood species, etc) animal damage, and natural mortality. The trees are planted on 13' centers and that makes a good clearance for mowing with our brush hog and finished off with our small Kubota tractor. Controlling Vegetation: We have to control the vegetation around the seedlings to prevent mouse and vole damage. We do this by mowing between the trees and spraying. This also helps keep other competing vegetation and invasive weeds out. We use the herbicides Roundup and Crossbow sprayed manually, depending on what plants we are controlling. When we spray, we only do it near the tree, not between the trees, we leave the grass there to control the errosion until the trees eventually choke out the grass. Controlling Invasive Plants: We have identified several invasive weeds and plants on our property. We treat these weeds in and out of the timber area with systemic herbicides. Spraying is a big job with a lot of prepration and cleanup time. We are careful to follow the herbicide manufacturers recommendations, and only apply it on overcast, cool, and calm days. We use Roundup Pro to control the grass, general weeds, Tansy Ragwort, and various Thistles. We apply this Roundup twice a year, once in early summer, and again in fall to catch plants that have been produced by seed or other rootstock. We also use Crossbow to control the blackberries, Scotch Broom, Poison Oak, and the Maple and Alder seedlings. We apply the Crossbow only once a year and that is in the fall. Preventing Erosion: We are careful to divert runoff and maintain foliage on slopes and to avoid leaving any land bare. We are always working to keep the waterways grassed and that takes time and planning. Replanting: We replant young seedlings after animal damage (we have lots of deer and elk come through here), and interplant additional seedlings as necessary in order to maintain stocking levels at or above 300 trees per acre. Thinning and Trimming: The process of thinning has two benefits; first it helps the remainder of the trees grow faster, and have a better quality, and secondly; we can use the wood for our wood stove to heat our house. We also trim the limbs up as far as we can reach with the hand pole saw (about 15') and remove the dead or diseased trees. Maintaining Access Roads: We have an easement road across the neighbors property and two other roads that will provide access to our trees when they will be harvested. We keep these roads brush and erosion free. 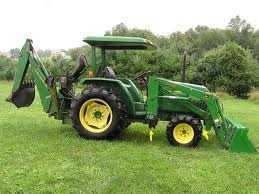 We have a John Deere 870 28Hp 4x4 diesel tractor with, front loader, backhoe attachment, 5' PTO driven brush hog, and a 6' rear blade. Also we have a smaller Kubota diesel tractor with a belly mower, a backpack sprayer, a 15 gallon tractor mounted sprayer, lots of hand tools, and two great chain saws. I receive much joy from working in the forest. Its quiet, smells good, and it is clean, (that is if you don't mind the mud, pitch, and sweat). I do not like working in the rain, so I wait for the non rainy days. The main problem is that you do not get any income for many years. Therefore, it is important to keep track of everything that you do for future reference.